In 896AD the Magyars, a host of nomadic tribesmen from Siberia and the ancestors of today’s Hungarians, first arrived in what is today Budapest and decided it seemed a good place to make their home. And travelling around the Hungarian capital on a city tour it is easy to see why. Boasting beautiful tree-lined Parisian style boulevards, such as Andrassy Avenue, a thriving café culture and noble palaces harking back to its Imperial past, Budapest has a romanticism that attracts tourists from around the world. Our tour guide Susanna, explains that the city of Budapest has gone through many transformations over the years. From a population of just 200,000 a hundred years ago, the city grew quickly at the turn of the 19th century to become home to some 2 million people, with the majority Roman Catholics, but also with a sizeable Protestant and Jewish minority. As something of an ethnic island within Europe, Hungarians are acutely aware of the history as the Hősök tere or ‘Heroes Square’ testifies. A semi circular memorial housing influential politicians and moments from Hungary’s past, such as the 1588 battle of Szikszó when Hungarian forces defeated Ottoman forces, some 100 years before the liberation of the city itself from Turkish rule. At the centre is the millennium cenotaph around which are depicted the tribal elders of the Magyars looking out at the country they had chosen as home after a gruelling journey across Europe. In our own journey around the city we see the variety of sites on offer to tourists from museums and art galleries, to circuses, zoos, opera houses and the nature lovers getaway of Margaret Island. 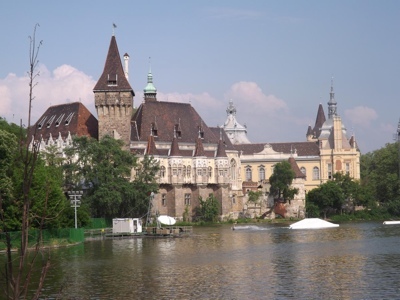 Today, the city is famous for the number of natural spas it offers, the oldest is a Turkish spa dating back to the 16th century, a time when Budapest was a part of the Ottoman Empire, but now in a poor state of repair. Originally two cities – Buda and Pest – that were separated by the mighty currents of the Danube, they were physically linked for the first time in 1840 by the Chain Bridge and was finally officially united as one in 1873. That being said the two are still very different, with Buda more grand and residential and Pest the life and soul of the city. Today the Chain Bridge, guarded by two lions on both sides of the river, is one of the iconic images of Budapest and we get a good view of it as we travel from Pest to Buda to visit Buda Castle. The journey up a steep winding road takes us to the entrance to Buda Castle, a natural strong point which dominates its surroundings and on which royal fortifications have stood since medieval times. Today, Buda Castle’s natural defensive position make it a great place to view the skyline of Budapest and its Fishguard Bastion offers incredible views of the city below. The vista includes the Hungarian parliament building, completed in 1905, and the third largest government building in the world. 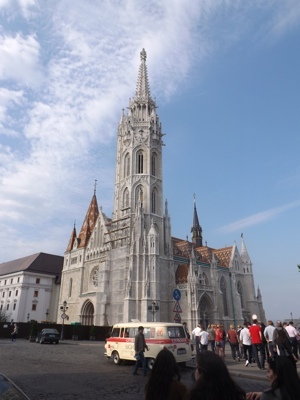 Also situated on the summit is St Matthias Church, built in medieval times and the place traditionally used by the Hungarian monarchs for their coronations.